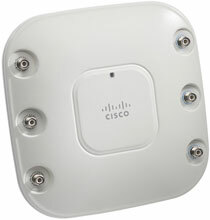 Provide reliable and predictable 802.11n wireless coverage for indoor environments. Cisco Aironet 1260 Series wireless access points provide reliable and predictable 802.11n wireless coverage for indoor environments. These enterprise-class access points deliver up to nine times the throughput of 802.11a/g networks for rich-media applications. Designed specifically for challenging environments, the Aironet 1260 Series supports external antennas and a broad operating temperature range.